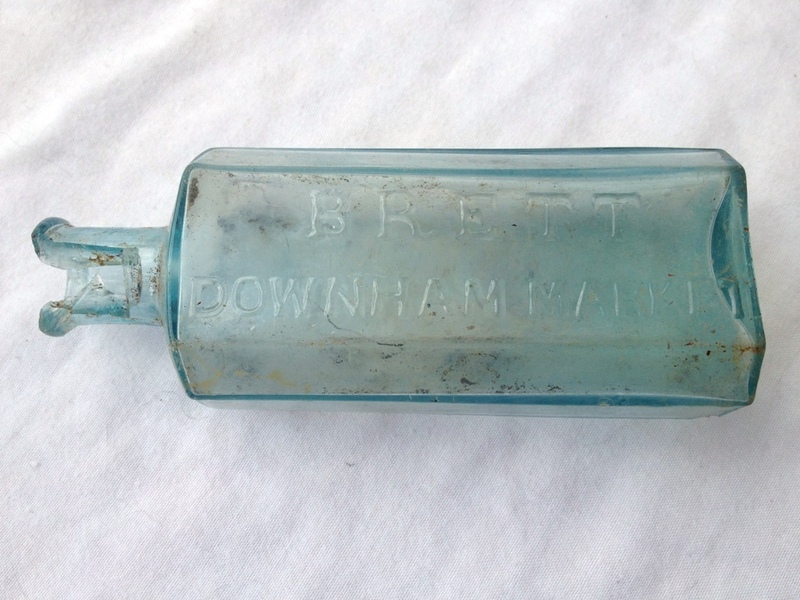 Glass Chemist Bottle Embossed "Brett Downham"
John Brett is listed from 1850 until 1865 at Market Place, Regent Street & High Street as a Chemist & Druggist & Grocer. Fred John Brett is listed in 1868 until 1875 as a Chemist, Druggist & Grocer and Wine & Spirit Merchant. Benjamin Howes Carver is listed between 1845 and 1879 at Bridge Street Downham. 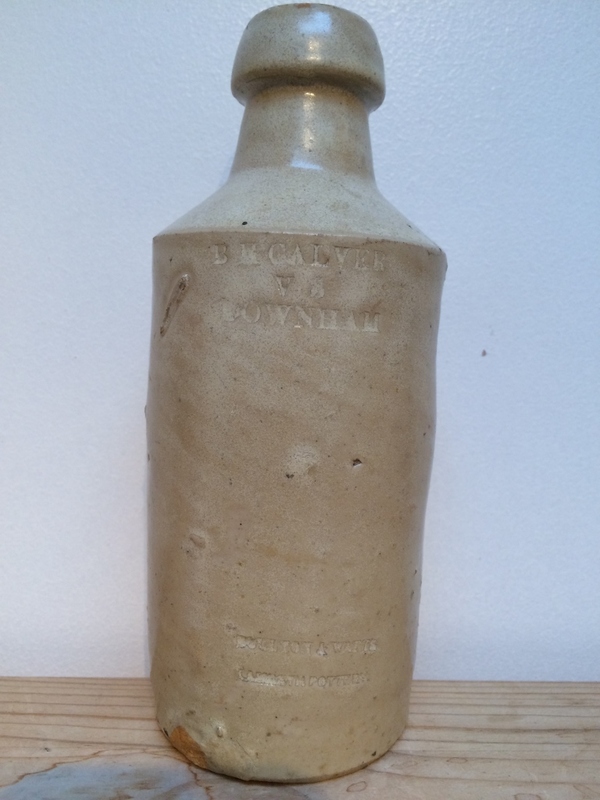 By 1883 Calver was joined by a Mr. Peterson to from Calver and Peterson, this is also the last listing. 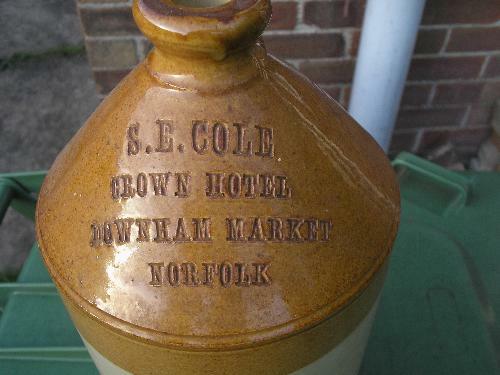 Two Tone Flagon Impressed "S. E. Cole Crown Hotel Downham Market Norfolk"
Sydney Cole took over from Robert Cole at the "Crown", Market Place between 1900 and 1904. His last listing in the "Crown" was in 1916. Marles Patent Bottle Embossed "G. Hartley & Son Regd Bretwalda Trade Mark Downham Market" Crown Cap Bottle Embossed "G. Hartley & Son Regd Bretwalda Trade Mark Downham Market"
Crown Cap Bottle Embossed "G. Hartley & Son Regd Bretwalda Trade Mark Downham Market"
George Hartley is listed from 1908 until 1916 as a greengrocer at Bridge St. 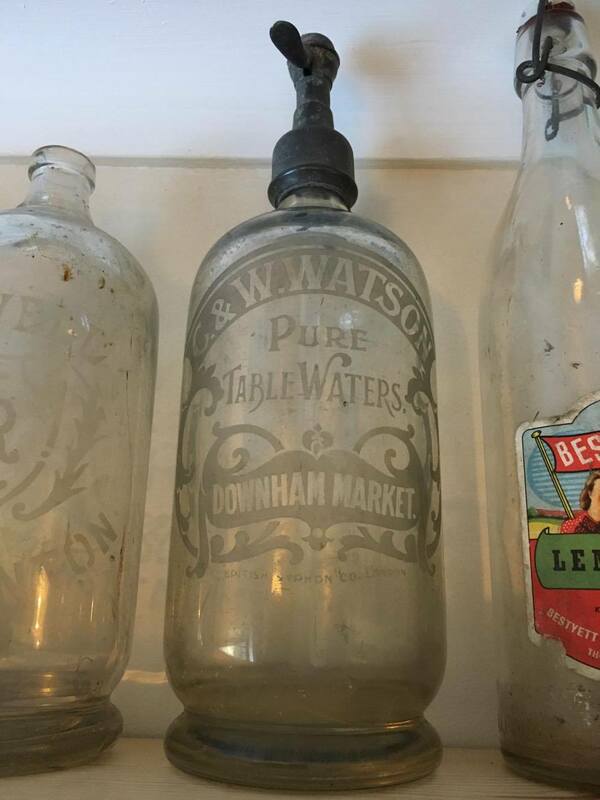 Shortly after 1916 he and his son took over the mineral water works of Charles Watson formerly C & W Watson. 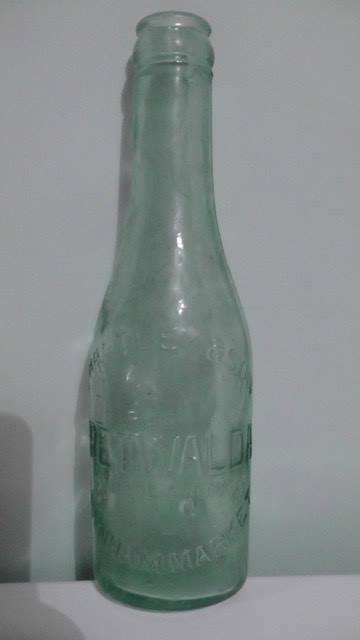 From 1922 and beyond 1932 he is listed as George Hartley & Son, mineral water manufacturers at Bretwalder, Bexwell Road. In 1929 he is also listed as a wholesale Potato Merchant at the same address. 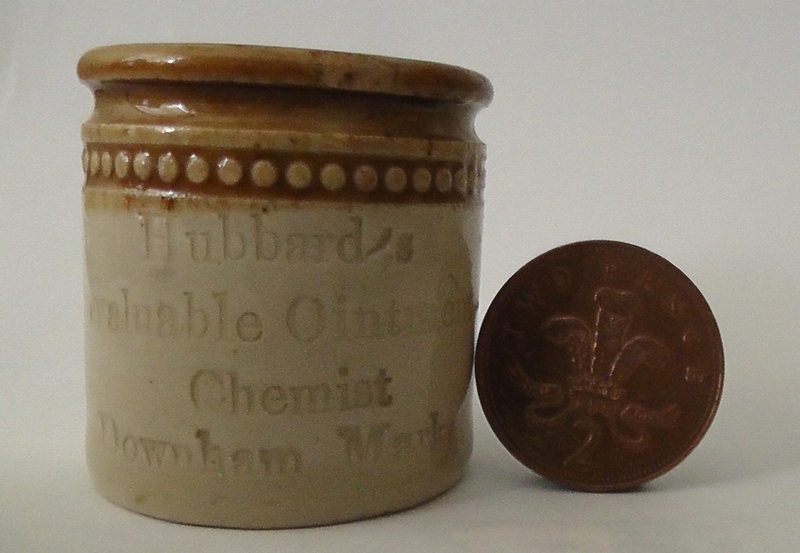 Two Tone Ointment Pot Impressed "Hubbard's Invaluable Ointment Chemist Downham Market"
George Hubbard is listed as a Druggist in 1858 at the High Street Downham. This continues until 1986 when he is also listed at paradise Road. Last listed in 1900. 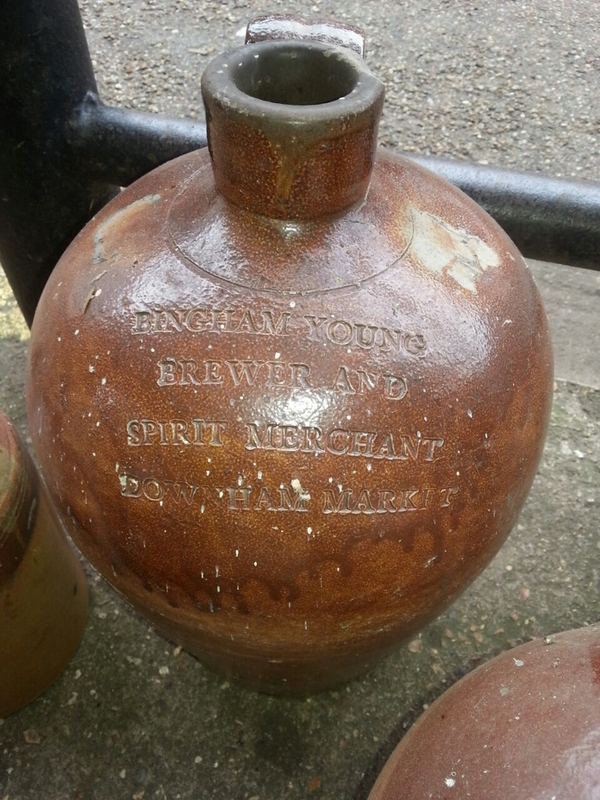 George Hubbard was also listed between 1858 and 1900 as a wine and spirit merchant and dentist. Two Tone Footwarmer Printed "A.B. 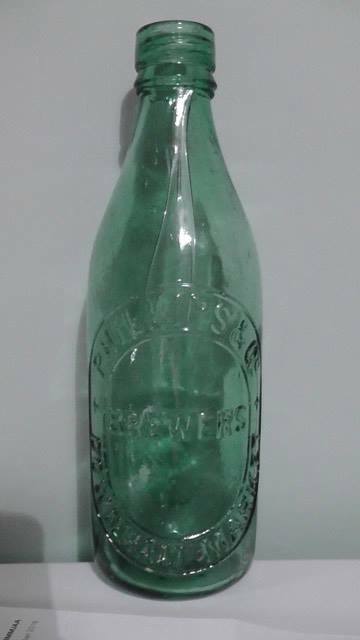 Laxon High Street Downham Market" 1 Pint Beer Bottle Embossed "A.B. 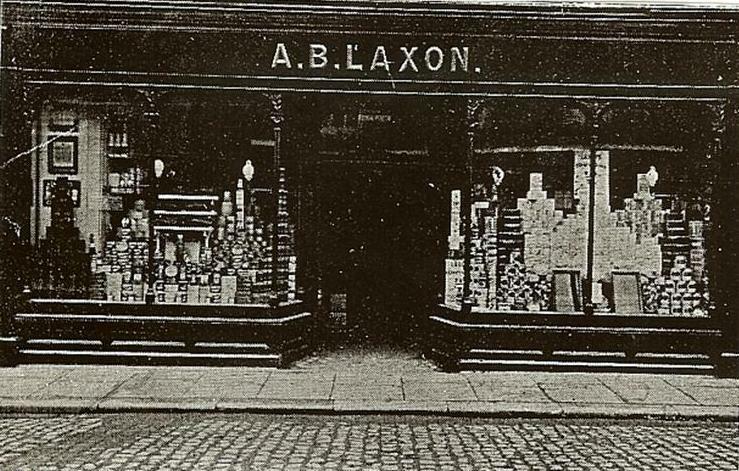 Laxon High Street Downham Market"
Allix Barker Laxon is first listed in 1888 when he had succeeded Henry Oakes as a family grocer and provision merchant & Italian Warehouseman in the High Street. In 1916 he is joined by his son to form A. B. Laxon & Son. They continue to be listed beyond 1932. 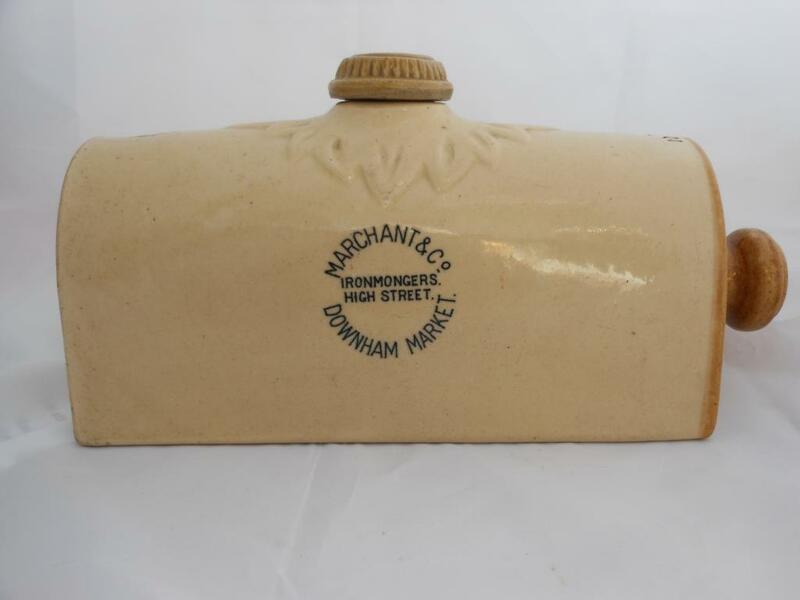 Two Tone Flagon Impressed RM Layton Downham"
Two Tone Footwarmer Printed "Marchant & Co Ironmongers High Street Downham Market"
Marchant and Mason are first listed in 1900 as ironmongers at the High Street Downham. 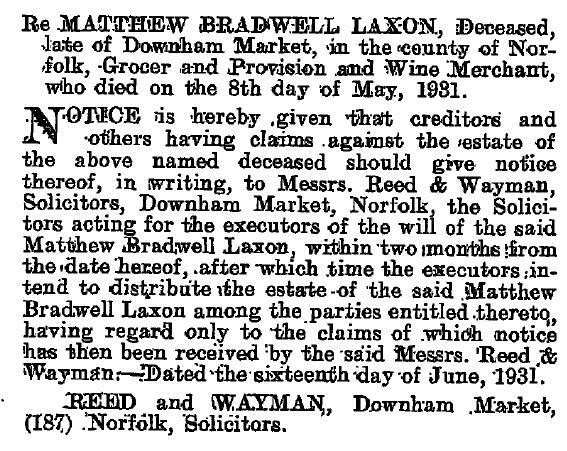 They continue to be listed until 1916 when Marchant & Co are first listed. 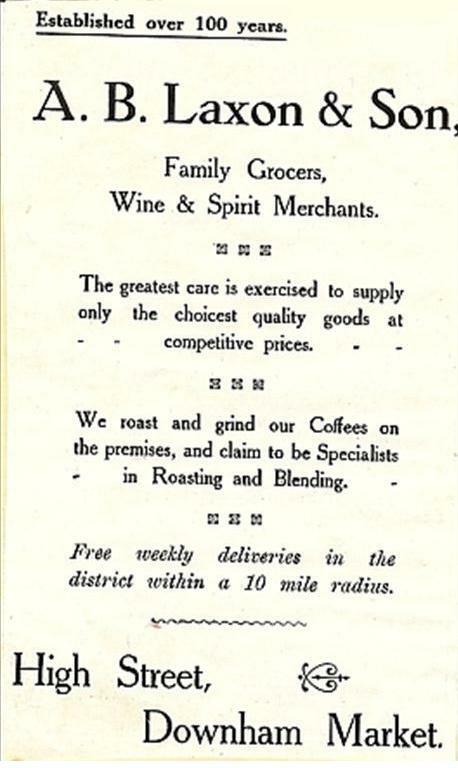 Marchant and Co are last listed as Ironmongers in Downham In the 1929 Directory. 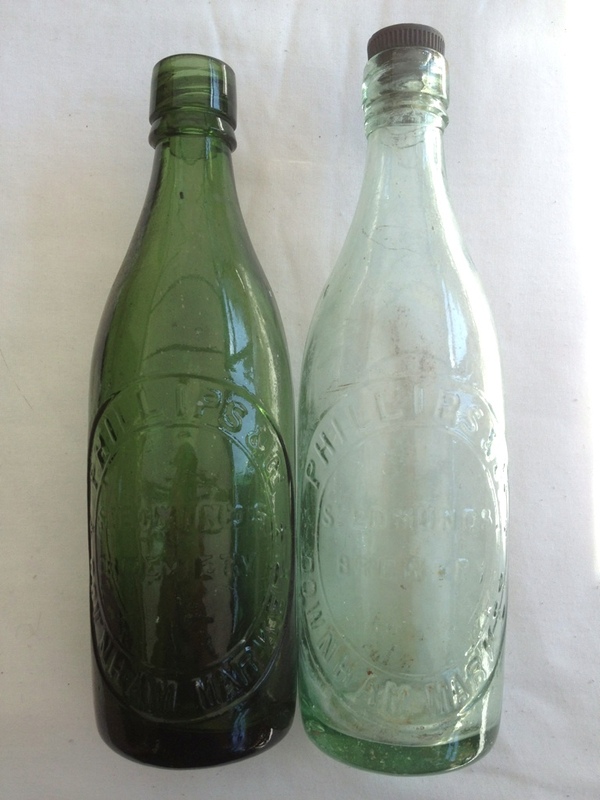 6 & 10oz Codd Bottles Embossed "H.R. 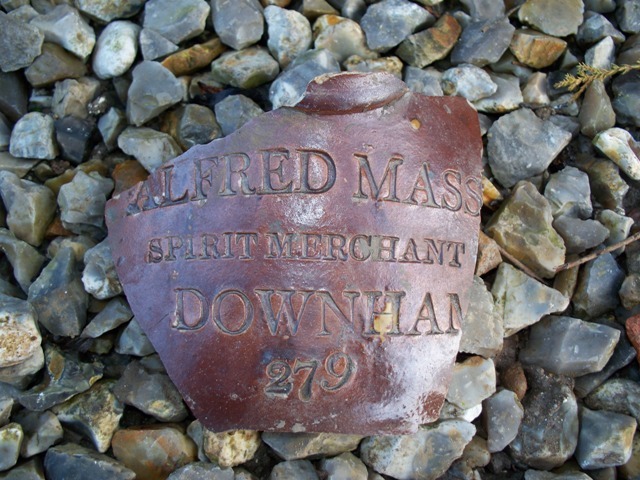 Martin Downham Market"
Saltglazed Flagon Impressed Alfred Massey Spirit Merchant Downham"
Slab sealed flagon impressed "I Miller Downam" Slab sealed flagon impressed "I Miller Downham"
The only listing for John Miller is in 1830 as an Maltster, Wine and Spirit Merchant & Corn and Seed Merchant at High Street Downham. In 1836 and 1839 he had been succeeded by Winifred Miller who carried on at the same premises. 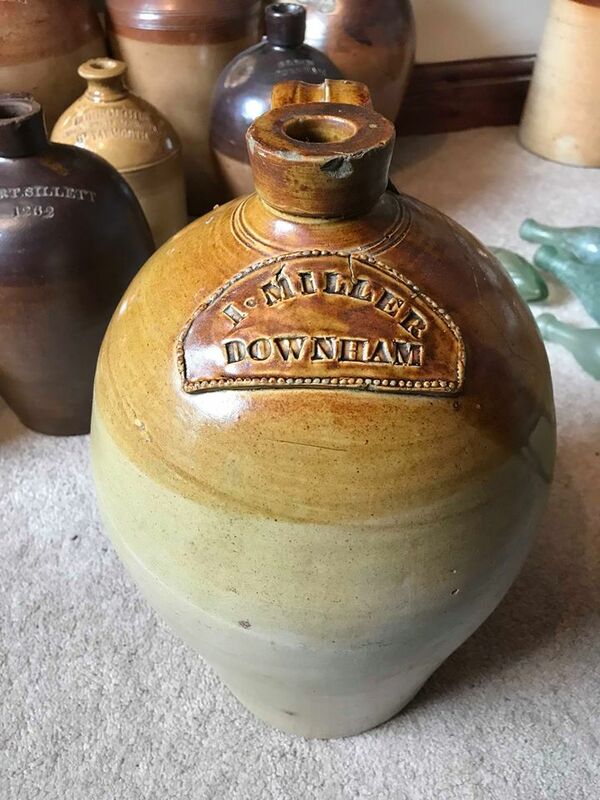 Two Tone Flagon Impressed "George William Mills Downham Market"
George William Mills is listed as a Brewer, Maltster and Spirit merchant at Union Brewery parsons Lane from 1863 until 1892. 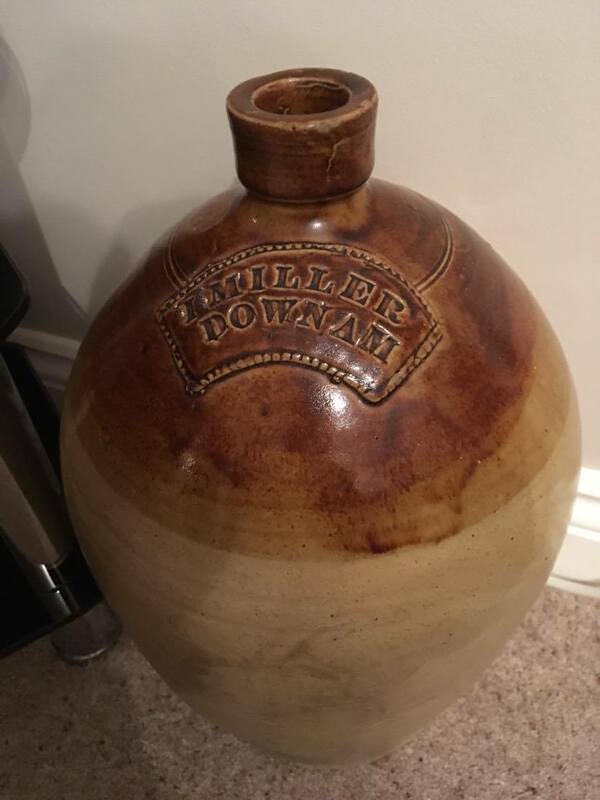 In 1890 he is also listed as a Mineral Water Manufacturer. 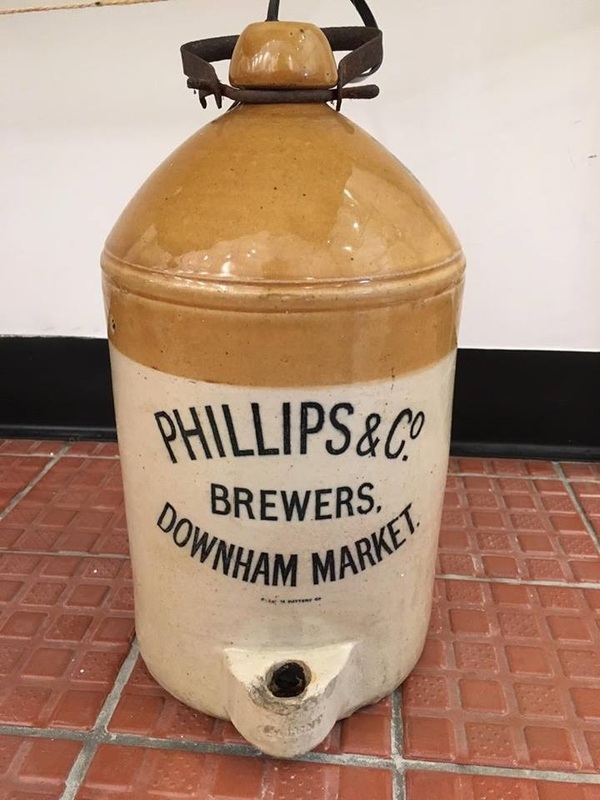 Pint Beer Bottles Embossed "Phillips & Co St Edmunds Brewery Downham Market" Pint Beer Bottle Embossed "Phillips & Co Brewers Downham Market"
Charles Reginald Phillips purchased the St Edmund's Brewery from William Newell in 1894 by 1896 the company was known as Phillips and Company. 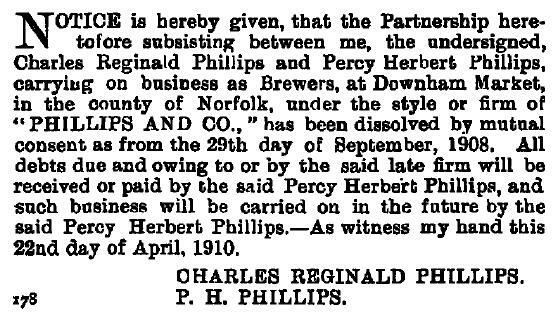 They purchased the Elm Road brewery at Wisbech in 1908 which was destroyed by fire in 1911. Brewing continued at Downham until the Second World War. 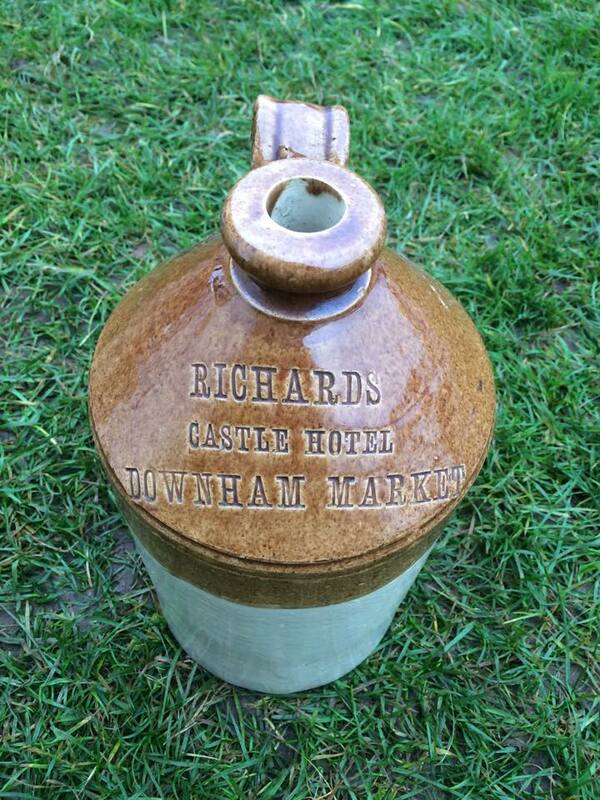 Two Tone Flagon Impressed "Richards Castle Hotel Downham Market"
James Harold Stutter & Co took over from Lionel Cooper and are listed in the 1933 and 1937 Directories in Bridge Street. 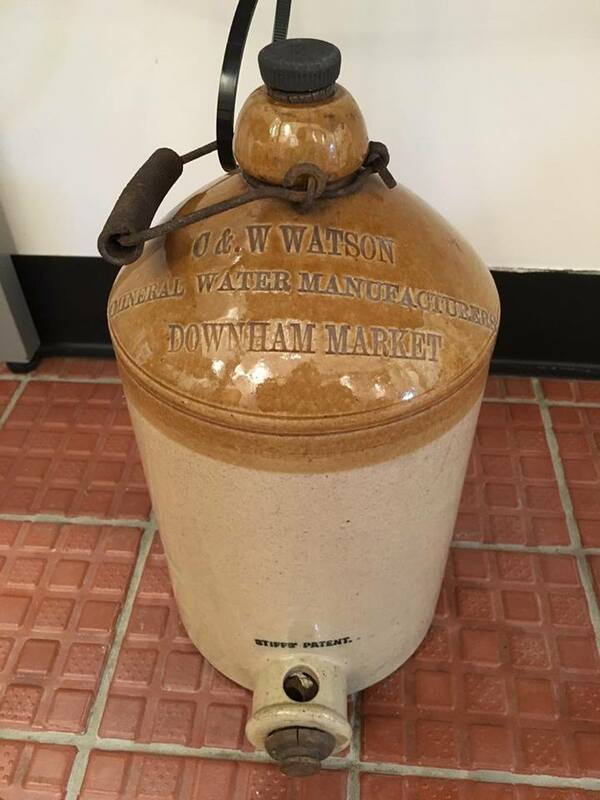 Two Tone Ginger Beer Bottle Printed "C&W Watson Home Brewed Ginger Beer Downham Market" 6 & 10oz Codd Bottles Embossed "C&W Watson Downham Market"
6 & 10oz Codd Bottles Embossed "C&W Watson Downham Market" 6 & 10oz Codd Bottles Embossed "C Watson Downham Market"
Soda Syphon Etched "C & W Watson Pure table Waters Downham Market" 1 Gallon Tap Jar Impressed "C &W Watson Mineral Water Manufacturers Downham Market"
Porcelain Stopper printed "C & W Watson Downham Market"
Charles & William Watson listed as mineral water manufacturers from 1904 until 1912 at Church Rd Downham. By 1916 it had become just Charles Watson at Bexwell Rd, George Hartley took over shortly afterwards. 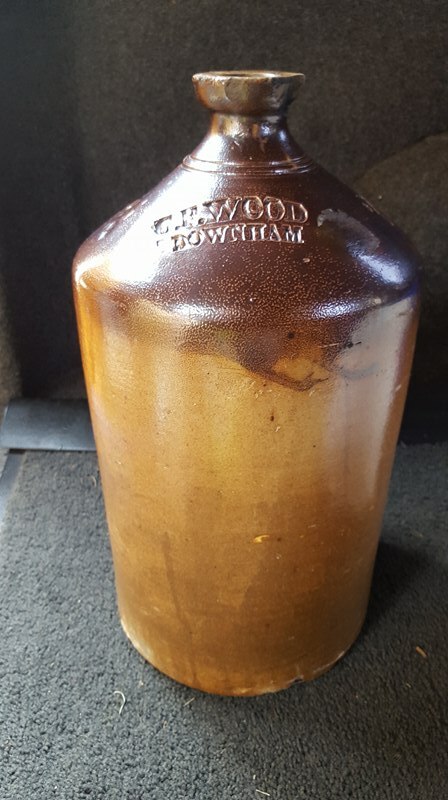 Two Tone Flagon Impressed "W. Wayman Downham"
Saltglazed Flagon Impressed "G F Wood Downham"
George Flower Wood is only listed as a spirit merchant in 1854 also a maltster at Bridge Road. From 1858 until 1868 he is listed as a corn and coal merchant and also maltster. 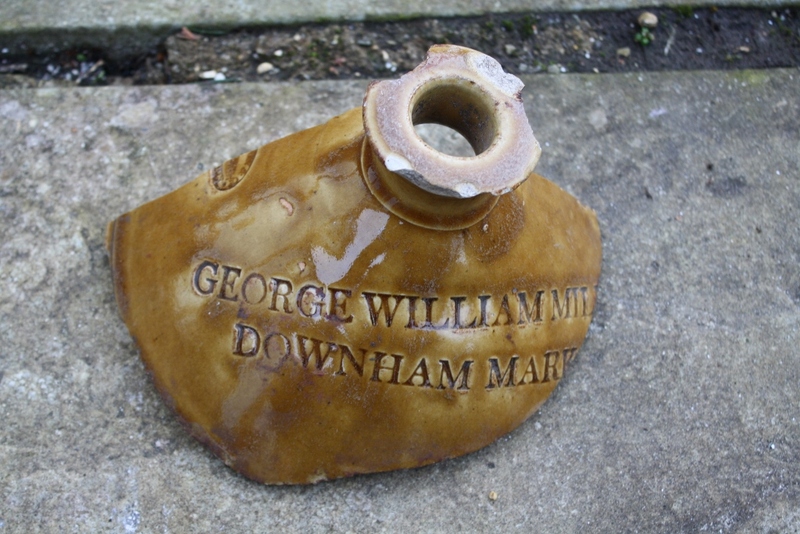 In 1875 he becomes manager of Downham Gas Works and continues to be listed until 1900. 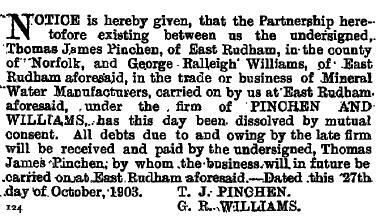 The only reference i can find to Bingham Young is the London Gazette entry when he is declared bankrupt in 1832.